If you are a web designer, you will agree that to keep the interst of the visitors, design of the website must be clear and intuitive. And, of course, the key to clear design is a clear navigation, so it’s important to make it both attractive and easy to use. Today we are presenting you some of the most hunky-dory jQuery-based navigation menus. If you come across more interesting stuff do share the links with us. The author builds a menu and animates it with some smooth effects. In this tutorial, author will show you how to create a navigation menu using jQuery to compete with flash based navigation. In this tutorial author will show how to create menu using random colors to add a bit more dynamism and flair as jQuery allows you to not only animate to a specified color, but also allows you to animate to a random color. In this tutorial, author will show you how to use jQuery for making Drop down menus are a really convient way to fit a large menu into a really small initial space. In this tutorial, Author will show you how to create the Apple-flavored Leopard-text-indent style in Photoshop, then create the needed HTML and CSS and last but not least improve it via jQuery. In this tutorial, author will show us what we can achieve with HTML5 and CSS3 when it comes to the staple of current web sites: the humble drop-down navigation menu. Author will also use jQuery to handle the effects and add the finishing touches for us. In this tutorial, author will tell us how To Create A ‘Mootools Homepage’ Inspired Navigation Effect Using jQuery. In this tutorial, author will show us how to create fancy accordion menu using jQuery. In this post, you’ll see two examples of accordion. First menu’s visibility get’s toggled on clicking on the header while the another menu’s visibility get’s toogled when mouse is moved over it. In this tutorials author will show you how to use idtabs. idTabs is simple and easy to use. In this tutorial author will show you how to create background image imagination with the help of jQuery. Here’s a drop down animated menu example made with jQuery. Author will show us how to make floating menus that move as you scroll a page. This is done using HTML, CSS and jQuery, and it’s fully W3C-compliant. Dropdown menus and menu bars have been heavily used since the early days of graphical user interfaces. Their use has become ubiquitous, and even expected, in desktop applications, and the web has quickly followed suit. This article is intended to describe an extremely basic, yet extremely powerful, technique for adding dropdown menus in your application user interface or website design. In this tutorial, author will show you how to create a navigation menu just like the one used in Digg. 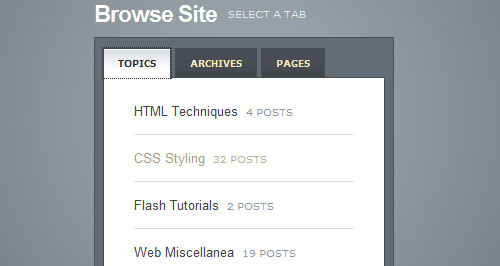 In this tutorial, author will tell us how to create jQuery tabbed navigation. In this tutorial, author will show you how to create a color fading efect with the help of jQuery. Question, are jQuery menus search engine friendly? Yes, ofcourse they are search engine friendly if the jQuery is built to be accessible (easily text/links accessible by spiders in these menu’s case), there are no SEO downsides to using it. If it’s not, you’re effectively hiding a lot of your content. Just want i’ve been looking for. What a great resource. Seen ALL of these a THOUSAND times, BORED. Good collection, thanks for sharing…. I’m just wondering if hiding content (i.e. text-indent: -9999em or display:none or left: -9999px;) which I believe many of these menus use, would eventually be penalized by search engines? Thinking of implementing a mega drop down using jquery but I’ll be hiding quite a lot of content! great compilation here. i’m still looking for a good mega-dropdown tutoiral though. I would like to begin by saying, thank you for providing me with the information I’ve been searching for. I’ve been surfing the internet for two hours looking for it and would have given my right arm if I would have located your website sooner. Not only did I find what I was searching for, but also found answers to questions I never thought to ask. Thank you for your wonderful web-site! Thanks Man .. Peace Out !! I do enjoy the manner in which you have framed this challenge and it does indeed present me some fodder for consideration. However, coming from what precisely I have experienced, I simply trust when other remarks pack on that people stay on issue and in no way embark on a soap box regarding some other news of the day. Anyway, thank you for this fantastic point and while I do not really agree with this in totality, I regard your viewpoint. I like the way you think. I had never considered that. good post, I found it quite informative, and it answered most with the concerns I had. I like the Apple-flavored Leopard design!! great job guys. my favourite one is the rounded black menu.. anyways thanks for sharing Sir.. These are very useful, take it from me i have used them! Thank sir ! for sharing it. It’s really helpful making my new project. Thanks a lot. Hey thanks for sharing these nice navigational effects. Specially, I liked the Lava-lamp Navigation Menu. Following and eagerly waiting for more incredible designs. Thanks. My favourite is the apple style menu. Thank you for sharing this awesome tutorial collection. Very very nice and very useful. need to apply downward arrow css on hover of navigation. thank you for sharing, let’s try.